Delivery from £6.00 to United Kingdom in 8 - 15 working days. 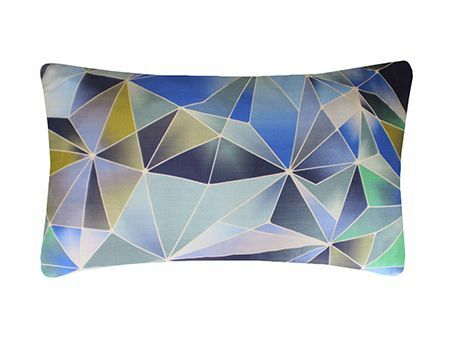 Contemporary Silk Geometric Cushion from Nitin Goyal London with a uniquely designed pattern mixing harmonious tones of teal and ocean blues. Taking inspiration from Geometry and rhythmic movement of lines, this truly stylish cushion adds richness and luxury to your home. Combining a delicate geometric structure with a tonal palette this cushion will bring a contemporary and luxurious update to any room. Every cushion, throw and bedspread is created from a sumptuous collection of fabrics, including cotton, linens along with cotton velvets and silks. All products are handcrafted to perfection, displaying our signature look of intricate smocking, pleating and stitching along with an interesting mix of timeless modern prints and fine embroidery for the luxury interior textiles market.